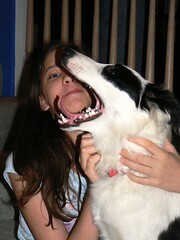 And For My Next Trick… I shall place my head inside the mouth of this vicious creature. Our friend got a new dog, a 7 month old Border Collie named Apache. He brought her over to meet the humans on Sunday night. Willow decided to come check her out too. We did not let her meet Indy or London yet as we didn’t think she was ready for that crew. She peed on our floor… but, really, who doesn’t? Photo amused me, so here it is.